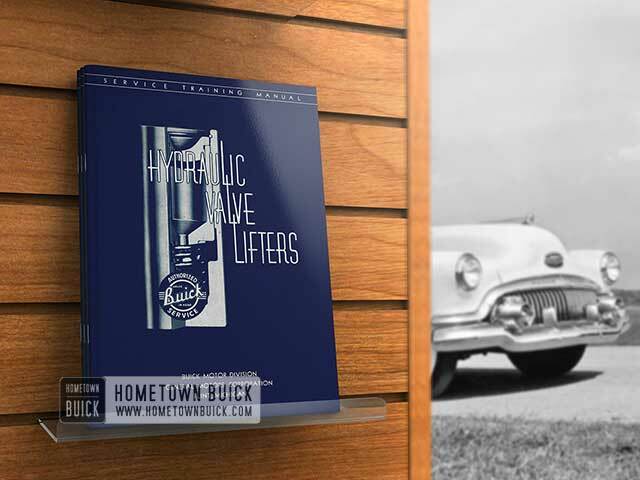 When an owner complains of noisy valve lifters or any other 1951 Buick hydraulic valve lifters trouble, it is very important for the service salesman to obtain a detailed description of the operating conditions under which the lifters are noisy. This will assist the mechanic in doing a thorough and complete job, eliminating comebacks. There are 6 general types of valve lifter noise complaints. They are listed below along with their cause and correction. Complaint 1: Rapping noise for a period of time after car has set with engine shut off. Cause: Oil is forced from the lifters that are riding the lobe of the cam with the engine stopped. It usually takes a few seconds for the lifters to fill again after the engine is started. The length of time it takes for the lifters to fill is dependent mainly upon the viscosity of the oil and somewhat on ball travel. In cold weather when the oil is thick, it will take longer for the lower chamber below the plunger to fill with oil than in warm weather. In cold weather no attempt should be made to correct this condition unless it occurs almost daily and the owner is using light weight oil as specified in the Owner’s Guide. Ball travel which is toward the high limit (.008″) will allow oil to flow to the lower chamber faster and help this condition. Complaint 2: Intermittent rapping that disappears and reappears every few seconds. a. Dirt or metal particles preventing the ball from seating. b. Steel ball has microscopic pits or defective surface (flat spot or varnish). a. Pour the oil which was in the lifter body on an absorbent piece of white paper toweling and check for dirt or metal particles in the lifter which will necessitate a thorough cleaning of the system. b. A defective ball is difficult to visually inspect. It is for this reason that whenever lifters are cleaned and checked the ball should be replaced with a new one each time. Complaint 3: One or more lifters noisy on idle and up to an engine speed of 25 MPH and quiet above that speed. a. The oil is leaking out of the lifter too fast due to too much clearance between plunger and body. b. Ball travel greater than .008″ allowing the valve linkage to be noisy because it takes too long for the ball to seat. a. The noise level with this condition is not a definite clatter but is annoying when audible in the driver’s compartment with the rocker arm cover on and the hood closed. 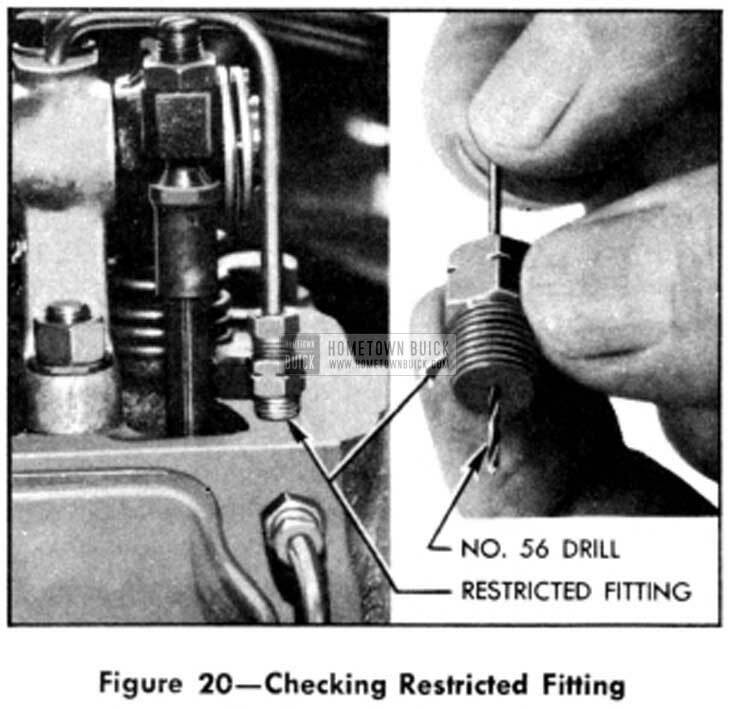 To make sure it is lifters causing the noise, valves, valve springs, etc. should be eliminated as probably cause as described in Section 3. With the engine idling press down on each rocker arm ball stud with an equal pressure and force the oil out of each lifter lower chamber. A comparison can then be drawn between those lifters which empty quickly versus those which take a long time to empty under equal pressure. If one or more lifters empty quite fast, they should be removed and their leakdown rate checked, Section 8 b.
b. If the noise is audible in the driver’s compartment and none of the lifters appear to have a fast leakdown rate when checked as described above, remove the noisy lifters and check and correct their ball travel, Section 8a. c. The ball seat on the bottom of the plunger may be inspected using a magnifying glass. Any nicks or burrs on seat require replacement of lifter. Complaint 4: Lifters develop loud clatter when engine remains on idle for a prolonged period which disappears when engine speed is increased. Cause: Lack of sufficient oil to lifters on idle allowing them to pump down. 1. Pry the oil inlet pipe out of the top of the No. 1 rocker arm shaft bracket. If oil does not flow in good volume, stop the engine and remove the restricted fitting from the top of the cylinder head. (Restricted fitting is notched.) Check the hole in fitting with a # 56 drill for size and be sure there are no burrs around the hole. See Figure 20. If the oil lines are open and the volume to the overhead appears satisfactory, yet the front lifters continue to pump down on idle, drill the hole in the restricted fitting with a # 50 drill. This will allow more oil to flow, supplying a larger amount of oil to the front lifters. CAUTION: Do not enlarge the hole in the fitting unless the above condition is encountered. The push rod bleed hole diameters have been reduced and it is impossible to tell what size hole they have; therefore, enlarging the restricted fitting hole on jobs with the small push rod bleed holes will result in an oversupply of oil to valve stems and increased oil consumption. Complaint 5: Lifters generally noisy most of the time regardless of car or engine speed. a. A small particle of foreign material holding the ball off its seat. b. Defect in the ball seat or internal parts of the lifter. c. Excessively worn lifter foot and/or lobes on camshaft. d. Varnish and/or dirt restricting the operation of the plunger in the body. e. Too high an oil level in crankcase. a. With the engine idling, strike the rocker arm above the rod end several sharp blows with a light rawhide hammer. If the noise disappears, it indicates some piece of foreign material was keeping the ball from seating, requiring cleaning of the lifters. Plunger being stuck down in the lifter body which requires close inspection of lifter parts. Worn lifter foot and/or lobe on camshaft. Bad ball, ball seat and retainer in lifter itself. c. Inspect the lifter foot. If the foot is worn excessively, concave, scored or spalled the lifter assembly should be replaced. Whenever a defective lifter foot condition is encountered, the corresponding camshaft lobe should be inspected for wear. With the cam nose up, extend finger through guide hole and feel nose surface. This can then be compared with a cam lobe which is known to be in good condition. d. Lifters which are removed for a noisy condition should be disassembled immediately to determine whether further work should be done on the engine other than merely working on the lifters. If a varnish or dirt condition is present, remove the rest of the set for a thorough cleaning, inspection and test to make sure the job is not back in the shop again in a short period of time. If either of these conditions is present and appears to be quite serious the top of the cylinder head, rocker arm shaft assembly and engine should be thoroughly cleaned. Make sure that the job does not come back. Do a 100% job on every job. e. A high crankcase oil level will allow the crankshaft to churn the oil injecting air bubbles throughout the system. Air bubbles will cause most of a set of lifters to be noisy and the push rod will spit oil and air from the bleed hole under the shroud rather than a solid stream of oil. It will be necessary to drain the oil to the proper level and find and correct the reason for the high level. The engine will then have to be run until all the air is ejected from the system. Complaint 6: One or two lifters develop loud clatter while car is being driven at normal operating temperature or above which disappears when engine cools off. a. Score marks on plunger. Score marks on plunger will not hold lubrication when hot causing it to seize. After engine cools it operates satisfactorily until it becomes hot again. b. Too slow a leakdown rate. Fit of plunger to body is so close that high temperatures cause the plunger to seize to body. a. Remove the affected lifters if they can be located. Then clean and inspect them. Sections 6 and 7.
b. Remove all lifters and clean, inspect and check leakdown rate. Sections 6, 7 and 8.